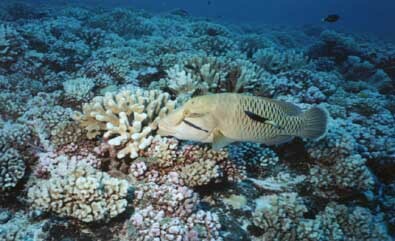 A good example of a spur and groove reef is Jacks Hall. This 40 ft ( 12 m ) medium-profile reef has finger coral, brain coral, star coral and occasional elkhorn coral and a variety of sponges. Drifting with the current you pass over a section of reef followed by a sand chute , another reef section and another sand chute and so on. Nurse sharks frequent the area and can be found often napping in the sand. When you are a keen observer, you will be able to spot scorpion fish blending perfectly with the background of the reef, or the bearded fire worm , a creature not to play with!. Less dangerous, but no less attractive, is the lettuce sea slug, which you may find here.